With the alveolar gas equation we can calculate alveolar partial pressures of O2 (PAo2) and CO2 (PAco2). The simplified formula shown below demands a CO2 free inspiration gas, which will practically cause only minor inaccuracy. The equation shows that under hyperbaric air breathing conditions a significant hypoventilation (ie with PAco2 of 80mm Hg) will not lead to hypoxia. This is because a constant inspiratory O2 fraction will lead to a rising Po2 proportional to pressure. The main problem of hypoventilation under hyperbaric conditions is hypercapnia3. The response of respiratory centre is modulated by peripheral chemoreceptors at aa. carotis and aorta and by central chemoreceptors on the floor of the fourth ventricle. Peripheral chemoreceptors mainly respond to a dropping pO2 below 60mm Hg. Besides this they also respond to dropping pH, rising pCO2, low blood pressure, increased body temperature and to stimulating agents like nicotine, acetylcholine and CO. Central chemoreceptors mainly respond to increased pCO2, which is associated with dropping pH in cerebrospinal fluid. About 78% of responses to increased pCO2 derive from central chemoreceptors. Figure 1.3-8 shows reactions of respiratory system to changes in inspiratory pCO2 at different pO2 levels under normobaric conditions3. APaCO2) will increase more strongly at low levels of PaO2 than at high levels of PaO2. At normal PaO2, increase in ventilation is about 4 l/min/mm Hg PaCO2. 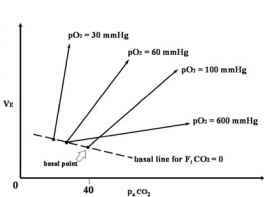 If there is no CO2 in the breathing gas (dashed line in figure 1.38), ventilation is increased by low levels of pO2 as well as by high levels of pO2. By this mechanism low pO2 stimulates ventilation via peripheral chemoreceptors3. The mechanism by which increased pO2 stimulates ventilation is slightly more complex. At increased pO2 at least one part of cerebral oxygen needs is supplied by physically dissolved oxygen. 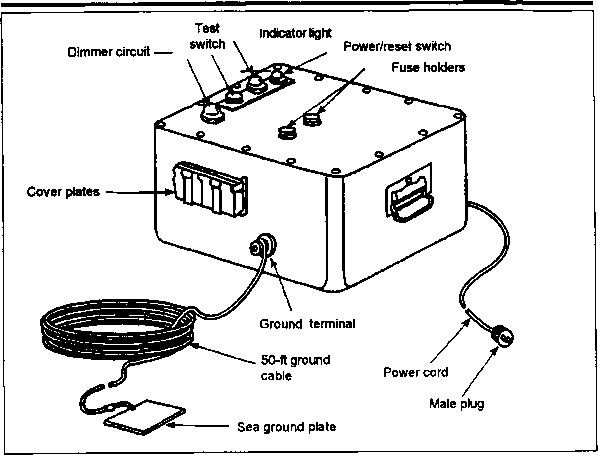 In this situation less than the normal haemoglobin-bound oxygen is needed. Because haemoglobin with a high oxygen load is not able to bind as much CO2 as normally (Haldane effect6), CO2 has to be transported to a higher amount as bicarbonate and physically dissolved CO2. Hereby pCO2 in venous blood and cerebral tissue is increased. As a result the increased cerebral tissue pCO2 stimulates ventilation (VE) and thus leads to the lowering of venous pCO2 in spite of the unchanged CO2 production3. Under hyperbaric conditions hyperoxia is the most important factor for the development of hypercapnia. When breathing air, nitrox or heliox with a fixed percentage of oxygen, pO2 increases parallel to rising pressure. Table 1.3-1 shows the effect of hyperbaric hyperoxia on ventilatory responses to increased pCO2 at rest7. The maximum amount of ventilation possible per minute is limited. This limit is reduced by increasing the density of the breathing gas. When the necessary ventilation to accomplish physical work approaches this upper limit, it will barely achieve the ventilation rate required to cope with metabolic needs. This will lead to hypercapnia. A similar restriction of ventilation is observed when ventilation work becomes very high at a certain workload. The respiratory centre seems to tolerate hypercapnia easily if this prevents excessive respiratory work3. Breathing gas is flowing through the airways following the pressure difference between alveolar pressure (Palv) and ambient barometric pressure (PB). When the thorax is widened breathing gas flows into the lungs, and when the thorax is compressed breathing gas flows the opposite direction. The flow of breathing gas is either "turbulent" or "laminar". Laminar flow is found mainly in small terminal airways, whereas turbulent flow is prevalent in the upper airways3. In laminar flows, the flow rate is directly proportional to the driving difference in pressure and to airway radius to the power of four, and it is in reverse proportion to the gas viscosity. Thus, when the airway radius is halved it needs a 16-fold pressure difference to reach the same gas flow.